PS3FPC331 Quick Change Pole Saw w/ Jameson Saw Socket and 13" Samurai HD Saw Blade . 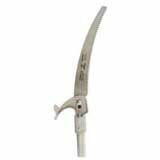 More popular quick change tools give your pruning poles many jobs. These tools fit into the female ferrule of all Jameson and Marvin sectional and telescoping poles.